Scientists at the University of Birmingham have discovered a unique mechanism that drives the spread of a deadly infection. Cptococcosirys is a rare and deadly fungal infection that affects the lung and brain and usually only occurs in people with impaired immunity. However, one strain of the fungus – known as the Pacific Northwest strain of Cryptococcus gattii - has gained the ability to infect otherwise healthy individuals. Cryptococcus gattii was considered a tropical fungus primarily found in places like Brazil, New Guinea and Australia, but it was found to be the cause of the Pacific Northwest Outbreak of Cryptococcosis in the US and Canada which began in 1999 and has seen hundreds of humans and animals being infected. The infection affects the lungs first, because it is acquired by inhaling fungal spores. In the absence of therapy, and sometimes despite it, the infection quickly spreads to the brain and other organs with often fatal consequences. Those infected with the disease have to undergo antifungal drug therapy that can last months - but those drugs often fail to curtail the disease and instead surgery is required to remove the infection from the lungs and central nervous system. 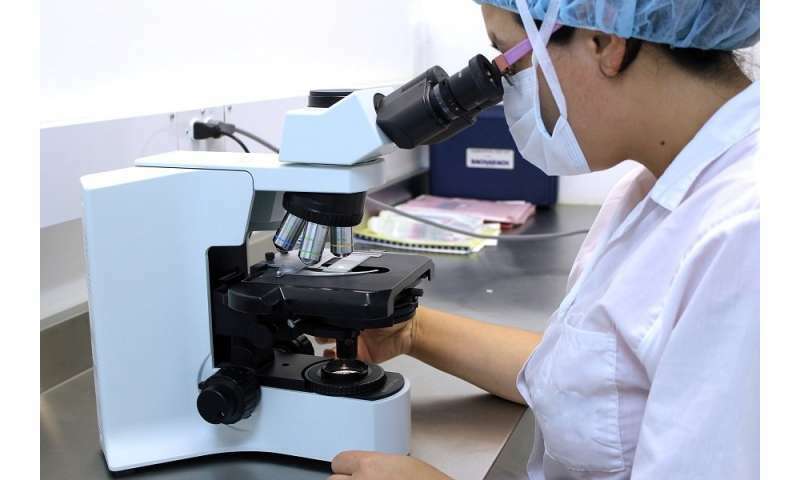 Lead author Dr Ewa Bielska, of the University of Birmingham's School of Biosciences, said: "It is vital that new drugs are developed to combat this disease, and in order to do that we need to find out how the disease spreads. "Four years ago the University of Birmingham carried out research which demonstrated that the high virulence of this Cryptococcosis gattii strain results from its remarkable ability to grow rapidly within human white blood cells which relies on a unique 'division of labour' mechanism within the infection. "To achieve this, individual fungal cells must work together to coordinate their behaviour, but how they do this has, up until now, been unknown." Now the University of Birmingham's latest research, funded by the European Research Council and published in Nature Communications, has discovered that this 'division of labour' can be triggered over large cellular distances and is mediated through the release of microscopic fluid-filled "bags" called extracellular vesicles. Professor Robin May, Director of the University of Birmingham's Institute of Microbiology and Infection, said: "These vesicles act like 'carrier pigeons', transferring messages between the fungi and helping them to coordinate their attack on the host cell. "This is a previously unknown phenomenon in infectious disease, but also provides us with a potential opportunity to develop new drugs that work by interrupting this communication route during an infection." Professor May said that the latest findings were unexpected. He added: "Our initial expectation was that the fungus would only be able to communicate within a single host cell, but in fact we discovered that it can communicate over very large - in microbiology terms - distances and across multiple host cell barriers. "The fact that this long-distance communication turns out to be driven by extracellular vesicles' is even more intriguing. "Our research continues and is still at an early stage, but ultimately we could envisage developing drugs that interrupt this signalling pathway between fungi in order to confuse them and prevent disease spread in the patient." Some indication as to why or how the messaging benefits the bacteria would be nice.